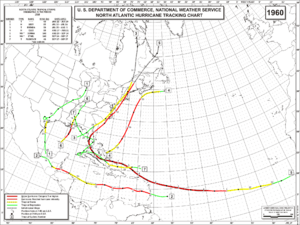 The 1960 Atlantic hurricane season began June 1, 1960 and ended November 30, 1960. This season had low activity, with only 7 storms. This season featured the powerful, Hurricane Donna and also Hurricane Ethel. The name "Donna" was retired. 1960 Atlantic hurricane season Facts for Kids. Kiddle Encyclopedia.